I just wanted to comment on the storms last night in terms of northern activity. (Grad meteorology student at ASU). Maricopa County had a beautiful, long gust front pass through. While no activity occurred over PHX metro. The NNW portion had impressive storms fire up with great lightning and rain shafts seen from miles away. FCD-Maricopa had recorded 0.43in from 1844 to 1859 at Lake Pleasant. There were other hotspots in the NW, but not as impressive. The NE steering flow and that gust front gave the NNW portion of Maricopa County its first taste of the monsoons. Thunderstorms were more widespread over southeastern Arizona yesterday afternoon. There was measurable precipitation at almost all reporting stations south and east of a line through Alpine – Saguaro RAWS – TUS – Sells RAWS. Many of these stations also had gusts of 30 mph or greater. There were two severe wind reports logged at the Storm Prediction Center this morning, and it gusted to almost 90 mph at the Atmospheric Sciences building (5th floor roof). Here at the house we had 40 to 50 mph winds that were carrying a heavy load of dust and grit – quite an ugly evening. No rain though, since there was little CAPE by afternoon at the lower elevations. A pronounced gust front raced into the lower desert northwest of Tucson but no new storms were triggered. Even though the steering winds were from the east-northeast, the cores of the heaviest storms propagated almost due south – they were propagating along and toward higher elevations where there was more CAPE available. In the Pima County ALERT network 36 stations had measurable rainfall in past 24 hours and these were mainly the eastern and southern sites. Yesterday was the first day with widespread, heavy to severe storms occurring in a summer flow pattern! The visible satellite image above shows the impressive array of storms during the late afternoon. Today’s TWC sounding appears to have similar CAPE to yesterday even though precipitable water is down a few mm. The morning steering level winds are srong from the east but NAM indicates the winds will weaken during the day. I don’t have time for an extended discussion since I’m on my way to several morning appointments. The 500 mb anticyclone still has three lobes this morning: one over southern Utah, one over far west Texas, and one over Texas/Louisiana border. The two eastern lobes are quite weak and the western lobe is predicted to dominate and to continue building toward the Four Corners. Middle-level temperatures are quite cool within the main anticyclone (-7 to -10C) and will help increase CAPE over much of the Southwest. An inverted trough lies across New Mexico from the boot heel to the northeast corner and will probably brush across extreme southern Arizona and the borderlands this afternoon and evening. The vertical shear profile, both in this morning’s TWC sounding and in the NAM forecasts, is quite favorable for storms to propagate from the mountains into lower elevations. The amount of low-level moisture has continued to slowly increase and the TWC sounding has 1.6 inches of precipitable water this morning. The southeast winds at low-levels may act to increase this some during the day. This morning’s sounding indicates that there will be decent CAPE this afternoon at low elevations with parcels at top of the boundary layer having theta-w values of about 23C or perhaps a bit higher. All of this seems to come together for an active storm day in south central Arizona, after several days with the storms limited to the far southeast. My guess for this afternoon and evening is that it’s a 50/50 toss up for storms and rain here at the house. Given the shear profile there’s also a good likelihood that some storms may reach severe levels. So, it appears that a more interesting day is on tap. Other things of note this morning – storms decayed over the GoC as they moved southeast from Sonora (see WV image on blog); large upper cyclone or inverted trough moving across north-central Mexico; another push of low-level moisture noted at Yuma as Td increased 10F from midnight to 1 am and there are widespread clouds across the lower Colorado Basin this morning; the past 24 hours saw no measurable rain over the Pima County ALERT gauge network. 1 – This morning the 500 mb anticyclone exhibits three separate centers: one over southern Nevada, one over eastern New Mexico, and one over southern Arkansas. Yesterday morning there was only one distinct center and that was over northeastern Oklahoma. So, the transition that has been advertised by the models is underway. By 72 hours the NAM indicates that the two eastern lobes of the high have been pushed south and weakened/dissipated, while the Great Basin anticyclone dominates and shifts to northern Arizona. This would leave us with a fairly typical summer pattern to begin the month of July. There is also a distinct inverted trough at 500 mb this morning that stretches from northwest Texas to the southwest Mexican coast. The models seem to indicate that this feature looses its coherence with time and becomes several fragmented vorticity maxima. In some ways it appears that the NAM is behaving as it did last summer - generating numerous small-scale waves and vorticity maxima over northwest Mexico and the Gulf of California. The user is then left having to decide if the model is actually capturing atmospheric reality for any given forecast cycle. 2 – This morning’s TWC sounding, see above, provides a nice illustration of how precipitable water values can be high (as per 1.4 inches plus this morning) but with CAPE values quite low or non-existent. I’ve shown an estimated sounding for 5 pm this afternoon (it may be a bit optimistic since I’ve used 8 g/kg as the mixed boundary layer’s moisture content). There is only a sliver of CAPE present. So, again today, better CAPE values will mainly be restricted to higher elevations. The afternoon’s estimate has a lifted parcel with theta-w of 22C – a marginal value. For really serious thunderstorm potential here in Tucson I’d like to see a lifted parcel with theta-w of 23 to 25C. It is interesting that there is a shallow layer of easterly winds near 600 mb (i.e., around cloud base). These winds may try to push some mountain developments toward the west, but the dominant steering flow should be the south-southwest winds between 300 and 400 mb. PS – Storms yesterday in Arizona tended to occur mostly in the southeastern corner of state – southeast of a line from Alpine through Sasabe. The highest amounts I found online were 0.96” at Tombstone and 0.31” at the Carr RAWS station. One station in the Pima County Alert network recorded precipitation (0.04”) in past 24 hours. 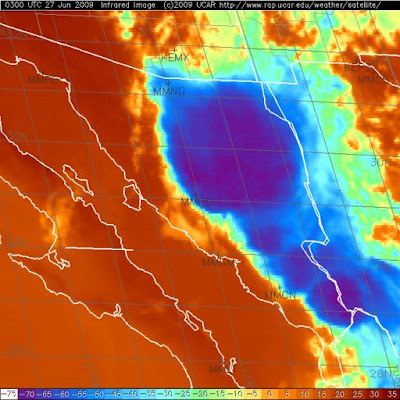 The most widespread storm activity of the season occurred over northwest Mexico last evening. See IR image from 0300 GMT above. This is an encouraging sign and the activity may have played a role in triggering at least a shallow GoC surge at Yuma early this morning. Note that Td jumped 8F between 6 and 7 am and was still at 69F at 9 am this morning. Precipitable water continues to increase slowly over south half of state and influx of low level moisture at Yuma will help continue this trend. CAPE at low elevations remains very limited and more boundary layer moisture would help, particularly as 500 mb temps are increasing. Yesterday there were no reports of measurable rain from the Pima County Alert network of 90+ gauges. Last weekend the ECMWF and GFS were at odds concerning the large middle level anticyclone that was over the Plains states, with the GFS indicating a westward shift toward the Four Corners. The anticyclone remains over northeastern Oklahoma this morning and the ECMWF clearly was better on that feature. It was however too wet over much of the Southwest. This morning all three models (NAM, GFS, and ECMWF) are in agreement that the strong, shortwave trough, currently over southern Canada southward to Colorado, will dig southeastward over the Great Lakes and push the anticyclone westward to the Four Corners region by 72 hours. So, a considerable readjustment of the large-scale pattern will be occurring during next couple of days. There may be some afternoon storms today at lower elevations, given the low-level moisture trends, but CAPE will be highest over the mountains. Chance of rain remains close to zilch here at our house. Surprisingly little in way of strong mountain storms yesterday; confined mostly to the far eastern part of state. About 5% of Pima County gauges had measurable precip last 24 hours – max being a pathetic 0.08” on Mt. Lemmon. Here at house a Trace with a couple of spits and sprinkles. But a nice cool day because of all the cloud. This morning the upper-level moist plume is pushing back to the east as the cool Pacific trough has moved onshore. TWC morning sounding – winds have shifted to west to southwest at all levels; precipitable water up to about 1.4 inches; but low-level moisture and CAPE not really there yet – although, there is a slight bit of CAPE indicated for low elevations. The cooling at 500 mb indicates that there may be more in the way of mountain storms today, if we get some heating at higher elevations. Looks like the drier Pacific air may take over for a day or two. Very moist air mass continues to the south but with no obvious features to push it northward – perhaps convection will increase over Sierra Madre Occidental foothills? What has happened to the winds aloft on the Mexican soundings? They have gone missing for at least a week now! Very significant convection with the strong tropical wave in the Caribbean – NAM indicates that this wave will move into Gulf of Mexico – something interesting to watch. Chance for rain here at house again about zilch for a real storm – steering flow is bad, unless something would develop immediately to the southwest. The plume of subtropical, middle-level moisture covers all but northwest Arizona this morning. 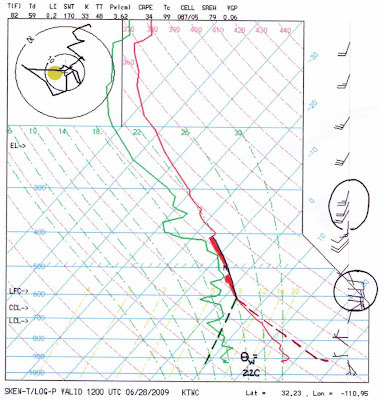 However, the Tucson sounding (above) illustrates that very little low-level moisture has accompanied the plume. It appears that high values of low-level moisture have reached north to the Guaymas and Hermosilla areas and the only cold cloud tops are isolated in the southern half of the Gulf of California. Thus, we start the day again with no CAPE at low elevations, thick middle cloud layers, and a hope that the high elevations will heat and convect much more this afternoon than happened yesterday. The current situation illustrates the importance of moisture recycling during the summer out here. If the mountains in southeast Arizona and northern Sonora had been active yesterday with heavy storms, then significant, cool moist outflows would have brought more moisture to lower elevations this morning. Further, it is not clear whether there will enough convection and/or cool advection and pressure rises with the upper-level trough over northwestern Mexico to trigger a low-level moisture surge. Note that this feature has also been mostly devoid of deep convection! A piece of it will shear northward across Arizona later today, but most of this feature will move off to the southwest over the Pacific. Thus, we are left mostly at the mercy of small and mesoscale convection at higher elevations to bring enough moisture to low elevations to fuel thunderstorms. My outlook for here at the house is not very positive for storms today – barring a miraculous low-level surge by mid-afternoon – chances here are about zero for meaningful rain. Perhaps a few light middle level sprinkles and spits, but mostly hopes that things will come together better tomorrow. A number of unusual things have been going on during the past 24 hours. First – minicane Andres appears to have totally dissipated during the night. The higher, cold cloud moved rapidly away to the west during late night/early morning and there appears not even to be a remnant low in the visible imagery. 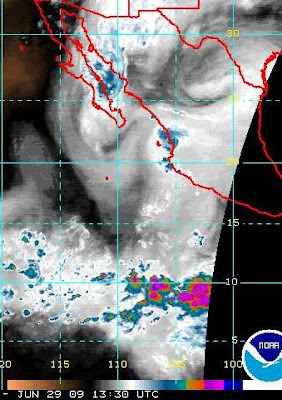 So, it appears that Andres might have helped move deeper moisture a bit north up the Gulf of California. But, if lower-level moisture increases dramatically tomorrow over south-central Arizona it will be due to the following factors. Second – a pronounced upper-level cyclone is moving westward across central Mexico and will be a player in our weather as it appears that it will pass by at the 36-48 time frame, as it pulls northward ahead of the cutoff low that moves onshore during this period. Third – the NWS models bring the Pacific, middle-latitude cutoff across the Great Basin, allowing the massive, middle-level anticyclone over the Plains to back westward over Arizona and new Mexico. However, the ECMWF continues to keep the anticyclone further east, allowing a moist flow to continue over the Southwest for a week or so. Fourth – compare the TWC and ELP soundings this morning. 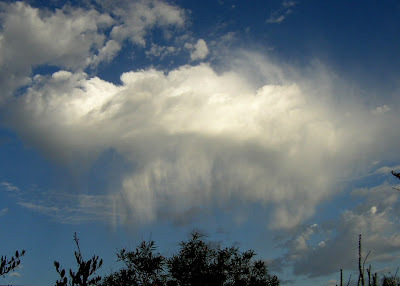 The moist plume around the anticyclone has ELP in a deep, moist and unstable airmass. The light winds and CAPE in that sounding indicate a clear threat for flash floods. In contrast, TWC has a considerably less moist sounding with a deep residual boundary layer that extends almost to 500 mb. Moisture has been increasing slowly but the sounding still does not have CAPE. The Phoenix sounding is similar and its old boundary layer extends to just above 500 mb – the difference in old boundary layer heights at TWC and PHX lead to a deceptive difference of 4C in 500 mb temperature! It appears that the evolution of all of the above may lead to a significant increase in moisture tonight and tomorrow over at least southeastern Arizona. So, the chance of storms will increase substantially tomorrow afternoon and evening. After that, it appears to be a watch and wait scenario. It is the first day of summer and, since the southwest US thunderstorm season is approaching, I plan to begin posting commentary on the blog again, after a long period of little activity. I felt that the longer-term forecasts this morning were interesting because the GFS and ECMWF appeared, to me, to be presenting quite different forecasts, especially after 72 to 96 hours. The GFS predicts a dry pattern with the 500 mb anticyclone (now over MS and AL) building westward to be over NM/AZ by 144 to 168 hours. The ECMWF, on the other hand, predicts another significant cutoff at 500 mb developing off southern CA, much like the past several events. So, the ECMWF has the baroclinc, westerly cutoff doing battle with the subtropical high during much of the forecast period. This leads to strong southerly flow and the ECMWF dramatically increases moisture over AZ/NM after 72 hours. I suspect that that the ECMWF may be the model to pay attention to this week – based just on persistence over the last 8 weeks or so. BOTH THE GFS AND ECMWF INDICATE A TROUGH OVER THE EASTERN PACIFIC MAKING ITS WAY ONSHORE INTO SRN CALIFORNIA LATE WEDNESDAY INTO THURSDAY. BY EARLY FRIDAY THE DIFFERENCES BETWEEN THE TWO MODELS BECOME QUITE DIFFERENT WITH THE GFS SHOWING A BAGGY TROUGH MOVING NORTH OF THE AREA...WHILE THE ECMWF SHOWS A CLOSED LOW STILL OVER S CENTRAL CALIFORNIA. THUS...THE ECMWF IS MUCH WETTER THAN THE GFS. MODELS IN GOOD AGREEMENT WITH UPPER RIDGE FINALLY EXTENDING WEST INTO CWA OVER NEXT 36 HOURS AS UPPER TROF OVER WEST COAST LIFTS NORTH OF THE RIDGE. THE WEST COAST TRO REFORMS TOMORROW AFTERNOON AND MAY CHANNEL ADDITIONAL MOISTURE INTO SOUTHERN PORTIONS OF CWA AND TEMPORARILY REDUCE CAP. ECMWF/GFS ARE IN VERY GOOD AGREEMENT WITH RESPECT TO THE PROGRESSION OF SYNOPTIC-SCALE FEATURES THIS WEEK. MODELS WERE IN REASONABLE AGREEMENT INTO THURSDAY WITH REGARD TO THE POSITION OF THE RIDGE AND WHERE THE BEST MOISTURE WILL SETUP BUT THE GFS AND ECMWF CONTINUE TO DIVERGE SIGNIFICANTLY BY LATER THURSDAY AND INTO THE WEEKEND. So, we can look forward to a week of interesting changes, whatever they will actually prove to be, and can place our bets with our individual, long-term model of preference.